21 Google Home tips, tricks and features | What Hi-Fi? The virtual voice assistant is now a reality - and found in devices such as the Google Home speaker. Here's how to get the most out of it. Google Assistant, the company's voice assistant, has made the leap out of your mobile and into your house, thanks to the Google Home smart speaker. Bringing Google's voice assistant to life in a smart speaker, Google Home takes the battle to Alexa and the Amazon Echo - and with the Apple HomePod poised to enter the market at the end of the year. This voice-controlled artificial intelligence technology is very much in its infancy, but there are already plenty of clever things you can do. Read on for our guide to the best Google Home features, tips and tricks. First things first, you'll need Google's new Home app - though you might already have it. The app has incorporated the Google Cast app, so if you're familiar with casting content from your phone to a Chromecast or Chromecast Audio, you're half-way there already. It's not just the Home app that might see familiar. A key strength of the Google Home speaker is the baked-in Google Assistant. This is the same voice assistant you'll find on smartphones, so some users may already know their way around the voice search (and benefit from their previous search history). To make the most of the Google Home experience you really need to connect your Google accounts. More than one? Make sure you add the one attached to your calendars, email account, maps, so the speaker can access and relay this information ("What's my schedule tomorrow? What's my journey to work"). You can register up to six accounts on one speaker. This speaker is all about voice-control. To get started you have a choice of two, count 'em, commands to wake the device. Both "OK Google" and "Hey Google" will work. Use "OK Google, stop" if it all gets a bit too much. If you want your speaker to stand out, you can always buy a coloured base. A variety of coloured fabric (£18) and metal (£36) designs are available from the Google Store. MORE: What is Google Chromecast? If you want to have a super-secret conversation and be absolutely sure your smart speaker isn't listening to every second, you can mute the microphones with a voice command or a button on the unit. A light will turn on to indicate the mics are completely off. 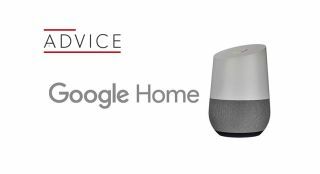 As for when you do use the Google Home, be aware that Google is storing that information and using it to serve advertising (those ads online for a kettle that appear after you search for a kettle). Of course Google is keen to point out this data will also improve the results you get and your overall Google experience. You can see your entire Google search history right here: myactivity.google.com/myactivity. And you can choose to delete it, too - either individual searches or en masse. If you're worried about your kids OK Googling their way to something they shouldn't, then you can block explicit music and video content. Head to 'More settings' on your Google account in the Home app and adjust the settings to turn on 'YouTube Restricted Mode'. You can do this for Google Play Music, too, but only on the Play Music website. Unlike your sat nav, there aren't (yet) a wealth of choices when it comes to the Google Home's voice. In fact, all you can do is switch between UK and US in the app, and get the relevant accent into the bargain. You don't have to use your voice for everything if you don't want. The touch control on the top of the unit is certainly a quicker way to change the volume than repeated commands to up the volume one notch at a time. And yes, like BBC iPlayer, it goes up to 11. You can request music in various ways, using an artist, a radio station, naming a podcast or even quoting lyrics (if they're famous enough). "OK Google, play the song that goes, 'Is this the real life?" should work. Google Home can easily be your alarm, timer and more. Got your hands full in the kitchen? "OK Google, timer 10 minutes" will ensure you don't burn your dinner. These two remain a staple of smart devices and Google Home has plenty of options for you here, too. Dive into the Home app to choose your preferred news provider - BBC, Sky, Reuters, CNN and more - and also select from bespoke news programmes for this speaker, such as the Telegraph's 5 by 5 daily news programme. Simple voice commands will have them beaming from your speaker. Unlike Amazon Echo, Google Home can deliver multi-room audio. It's not faultless from our experience but does allow you to send music to multiple speakers. If you want to keep it simpler you can opt to set two Home speakers up as a stereo pair. Use the Google Chrome web browser on your computer and you can cast audio from your computer to the speaker, a handy way to improve the audio on a video or play music from a source that isn't natively supported by Google Home. If you have a Chromecast Audio or Ultra then you can use Google Home to add voice support. YouTube voice support is live now and Netflix is on the way. "OK Google, play more funny cat videos." We weren't overly enamoured with the sound but nevertheless you'll want to connect your music streaming service of choice to make the most of it. Direct Google Play Music Access is integrated (and you can bag a 3-month trial) or you can connect Spotify or Deezer. If you're playing Spotify you can control the music with your voice, from the app, or on Spotify on a computer. AV manufacturers are getting in on the act, too, with Onkyo and Pioneer AV amplifiers set to include Google Home connectivity for voice control. If you have a Chromecast you can take advantage of HDMI CEC and you can also turn on/off your TVs with voice commands. Things get really clever when you add smart home devices into the mix. You can live the futuristic dream of controlling your home with simple voice commands. Nest thermostats, Philips Hue lightbulbs, Samsung SmartThings and Wemo are just some of the supported products. IFTTT is a great way to automate some of this cleverness. The surprisingly simple tool works across all sorts of devices and services, allowing you to create Spotify playlists from favourite tracks on Soundcloud, to tweeting every time you upload a picture to Instagram. Now Google Home is involved, with a whole host of Google Assitant commands available already - and you can create your own. Take a look at the IFTTT website for details. MORE: Google Home vs Amazon Echo: which is best?